SNCF Réseau and SNCF Mobilités have presented a specially equipped TER train to test ETCS on the French network. The new ‘rolling laboratory’ has been fitted out at the SNCF Technicentre in Nevers and, according to SNCF, is the result of an €11 million investment and 70,000 hours of work. Train X72633 / 634, which will replace one of SNCF’s existing test trains, has 27 sensors and antennae installed on its undercarriage, 23 antennae fitted to its roof and five sensors mounted to monitor the bogies, axles and wheels. After it is commissioned towards the end of 2018, the ETCS test train will begin validation tests. The train will also utilise France’s own TVM 430 in-cab signalling technology, allowing it to operate on the high-speed rail network. 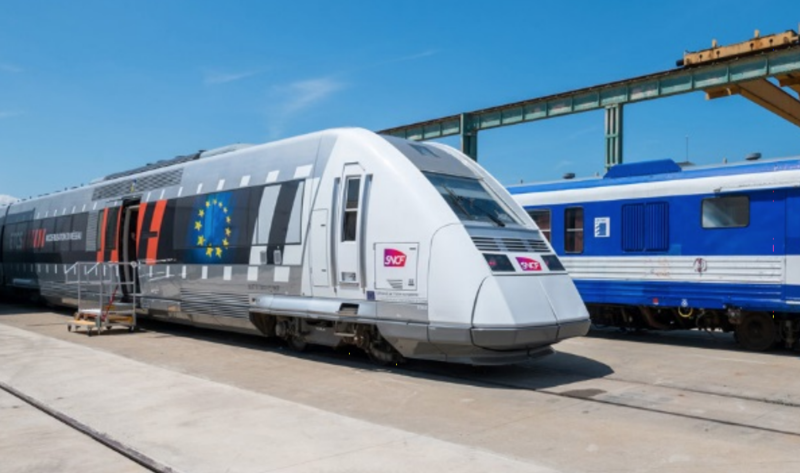 ETCS Level 1 has already been deployed on the Nîmes-Montpellier bypass and it is due to be commissioned between 2020 and 2022 on the Longuyon-Basel branch of the North Sea – Mediterranean corridor. ETCS Level 2 is already in use on the LGV Est, Southern Europe Atlantic HSL and Brittany-Pays de la Loire HSL. By 2025, it will also go live on the LGV Paris-Lyon and the Marseille-Ventimiglia routes.